Saturday just gone: I am a LOT pooplicated after a 4:30am wake up and a BIG day and LOTS of amazing things and then giving a concert then pancakes and home to bed by midnight. My sister arrived early in the morning and helped me wind the skein of yarn that a girlfriend had dyed for me and sent over from Canberra. It was lovely to have my sister sit there with her hands out, holding the yarn, while we chattered and wound. People started arriving at 10am and by 11am there were about 20 women there including TheHusband. It was a little unusual in that TheHusband was a part of it (most blessingways are female-only), but I am so glad that he did. It was a really special time for us and to have him also say "you are strong" meant a lot to me. We cleansed the circle with some water with rose, lavender and kunzea essential oils, passed around and everyone flicked their fingers in and flicked water around. Kristin lit the blessingway candle (big chunky white one that belongs to the women's group I'm part of) and added it to the collection of candles that were there for people to take home later, and invited people to introduce themselves. It was lovely that I got to add to that process and also reflect on the fact that I've known most of the women's group only a short while but these were some of my longest-serving friends ;). There were chorister friends who are now women's group friends, and midwife friends who are now women's group friends, and lots of choristers and women's group friends but enough cross-pollination to show me that I am in the righ place(s) in my life! Then Kristin invited people to share thoughts and stories and experiences of birth. This was when the amazing women I call friends really shone through. Billie reduced a lot of us to tears with a poem (again! She's going to have a reputation for that!!! ), and others spoke on their experiences, some very recent (Rose had her 3 week old with her) and some a little ways older (Emma had her 5 month old with her), and reminded me that I need to continue to trust the process and also surrender to it. To hear people say that they thought I had courage, and was true and unwavering to my path, made me laugh a little. I am sure that my outspoken confidence shines through but at times I have my doubts as people reading here will have seen. I have gone forward on this path towards a homebirth, confident that my body is amazing and can do what it will, and the idea of giving birth actually excites and scares me all in one but mostly I am looking forward to seeing how amazingly well my body works. It has made me consider though that this confidence perhaps appears as arrogance, and I think I heard some people warning me of that in their stories - to be prepared to surrender to a path that is not the one I expect. I take their gentle reminders to heart though! Then the circle was closed and blessed with yarn that I'd wound that morning, and cut and tied around each person's arm to wear until I birth. The candle was blown out and the blessing complete. People were invited to hand over a bead to me with a chat, and I ended up with a lot of beads!!! Alice, Cassia and Ali set to work making a necklace for me which is surprisingly heavy and very lovely and balanced. Billie then took me outside under a gazebo we have set up and took some photos of me - clad, unclad, draped in fabric and without my glasses! 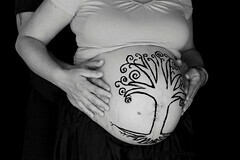 Then Kristin set to work on an AMAZING henna tree on my bump which made me so happy, and people took to the calico squares that I'd prepared and wrote blessings and thoughts on them for me to read during labour. I very sadly had to wash/scrub the henna off early for tonight as I had to wear a white shirt for the concert tonight, so I'm not sure how long it'll last. Once the henna was done, people started to leave and took a candle and a crane with them. The cranes I'd made for the cupcakes that Billy had made (lavender/vanilla, and chocolate/chocolate ones) as I hadn't wanted to ask for 20+ vaginas to decorate them, and everyone took one home after eating their cake I hope! Billy and I went back outside for a few more photos, and this time Osk came out as well and we have some lovely couple ones as well. My sister and Alice then tidied up, swept, packed the extra food into the freezer and let me nap a little. Then off for a concert and post-concert celebration and of course leaving me too tired not to snore, so Osk slept on the couch for the first time last night :(. The back room is abuzz with energy from yesterday and I can see it becoming a birthing space now, not just somewhere we eat dinner. I feel ready to birth now. 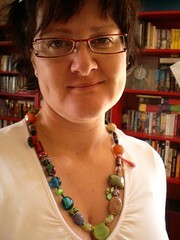 More photos care of Craftastrophies over on Flickr. 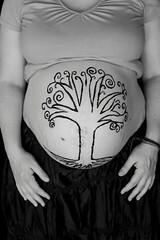 What an amazing belly-so beautiful! 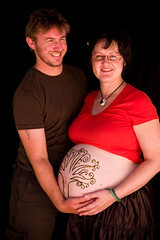 What gorgeous belly photos - such a treasure to keep. Just beautiful.